Lieutenant Colonel ‘Sir’ Tatton Benvenuto Mark Sykes JP 6th Baronet (commanding 5th Yorkshire Regiment) dies during the influenza pandemic. He is a traveler, Conservative Party politician and has been the Member of Parliament for Central Hull since 1911 and is the son of the late ‘Sir’ Tatton Sykes and diplomatic adviser, particularly about matters respecting the Middle East. He is associated with the Sykes-Picot Agreement, drawn up while the war was in progress, regarding the apportionment of postwar spheres of interest in the Ottoman Empire to Britain, France and Russia. He is the Member of Parliament for Central Hull since 1911 and one of the inspirations for the character of Mr. Dryden (played by Claude Rains) in the film Lawrence of Arabia(1962). Lieutenant Colonel Gavin Laurie Wilson DSO MC (Argyll and Sutherland Highlanders) dies at age 24. 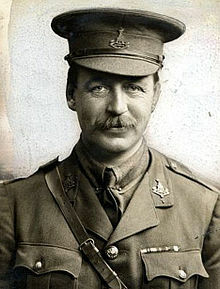 Chaplain the Reverend Sydney Rangeley Hewitt OBE (Royal Army Medical Corps) dies on service at age 27. Corporal Percy Harold Dimmock (Army Veterinary Corps) dies on active service at age 24. His younger brother will die on service in July of this year. Private Daniel Burns Connell (Argyll and Sutherland Highlanders) dies of influenza at age 30. His brother has been killed in October 1916. Rifleman Sydney Carpenter (Rifle Brigade) dies of influenza at age 19. His brother was killed in September 1914.